There’s nothing quite like having a backyard garden and growing your own vegetables. Not only is it a lot of fun to watch them grow, it would put nutritious and delicious food on the table and it is a very healthy and enjoyable way to spend the summer. That being said, there are many different types of vegetables to grow but a favorite of many people is the cucumber. Cucumbers are a fantastic vegetable and many people are surprised when they grow cucumbers on the ground that they don’t look like the cucumbers they find in the grocery store. That is because cucumbers at the grocery store are grown vertically, and it is something that you may want to try as well. Of course, you may have already been doing it but as you are about to find out, you may have been doing it wrong all along. Growing cucumbers vertically takes up very little space and it is a fantastic way to have healthy vegetables for your soups and salads. Since you are growing them vertically, it allows you to have more vegetables for every square foot of gardening that you do. In addition, it is a lot easier to harvest cucumbers when you grow them vertically because you don’t have to bend over and look through a lot of leaves in order to find the cucumbers to pick. It is just a matter of choosing the right spot and then following these easy tips. Choose a Sunny Location – cucumbers love the heat so you should wait until the freezing weather is over before you plant them. Look for a sunny location to grow the plant. Try a trellis – you could use a vertical trellis or a wire cage but cucumbers will readily climb when given the opportunity to do so. Even a tomato cage will work. 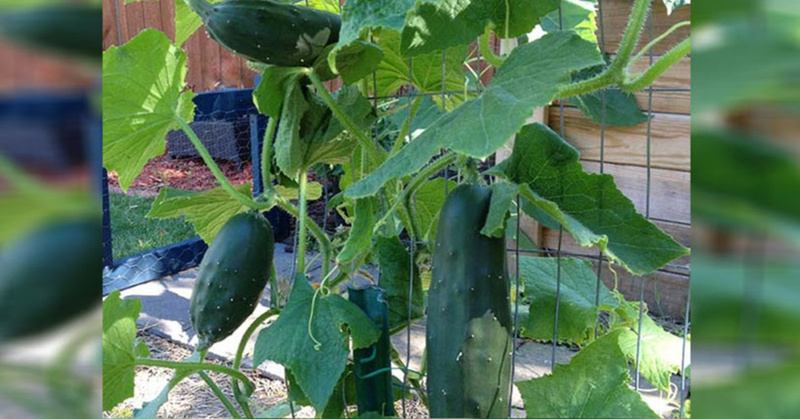 You may use 20 feet of garden space for bush cucumbers but when you grow them on a trellis, it uses less space. Try container gardening – it is possible to grow cucumbers in a container. Just add a post so they can grow upward. Give them support – growing cucumbers vertically means that you must provide enough support. Use a base that is sturdy, such as one made out of two by fours. The vine should be loosely secured to the support until they grow upward on their own. Water – cucumbers require a lot of regular watering and that will allow them to grow delicious and large. Keep an eye on the leaves – cucumbers produce many vegetables and they grow quickly. Look under the leaves of the plant to see if you have a cucumber growing and make sure you harvest it before it goes bad.